Because networks can be extremely complicated, with multiple protocols and diverse technologies, Cisco has developed a layered hierarchical model for designing a reliable network infrastructure. This three-layer model helps you design, implement, and maintain a scalable, reliable, and cost-effective network. Each of layers has its own features and functionality, which reduces network complexity. Access – controls user and workgroup access to the resources on the network. 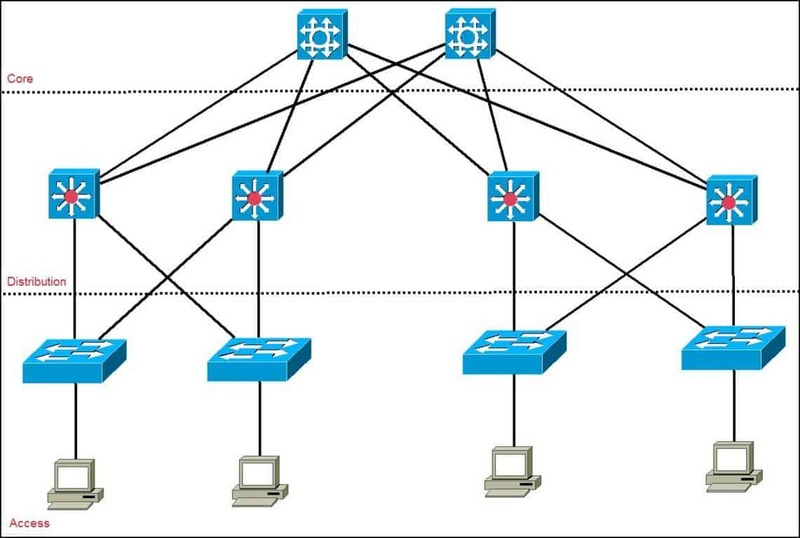 This layer usually incorporates Layer 2 switches and access points that provide connectivity between workstations and servers. You can manage access control and policy, create separate collision domains, and implement port security at this layer. Distribution – serves as the communication point between the access layer and the core. Its primary functions is to provide routing, filtering, and WAN access and to determine how packets can access the core. This layer determines the fastest way that network service requests are accessed – for example, how a file request is forwarded to a server – and, if necessary, forwards the request to the core layer. This layer usually consists of routers and multilayer switches. Core – also referred to as the network backbone, this layer is responsible for transporting large amounts of traffic quickly. The core layer provides interconnectivity between distribution layer devices it usually consists of high speed devices, like high end routers and switches with redundant links.